Happy Dance Power System is a lifestyle program like no other! With its unique approach to living a happier life through movement, eating healthy and a positive mindset. Happy Dance Power System comprises different programs that target lifestyle issues in a positive, fun and interactive way. Happy Dance is focusing on improving lifesytle choices, tackling obesity and stress which are linked to depression and an unfulfilled life. General Fitness, Family Fun, Corporate Stress Management. Our newly released program caters for youth with its school curriculum based Fitness / Movement program. Happy Dance is leading the fitness industry empowering people to grow and develop, not only their physical fitness but their relationships with their children and loved ones. Some of the many Happy Dance programs are Hip Hop, Samba and our GOLD program designed specifically for Aerobic Gymnastics. The Happy Dance Power System has been created by PAULO DOS SANTOS, who is a National and International Champion in Aerobic Gymnastics. Coming from a background of dance and theater and holding an Arts degree majoring in Dance, Paulo made his mark in the fitness industry as a well known Aerobic Presenter and is teaching all over the world at various International fitness conventions in over 30 countries. Now a resident in Japan, Paulo owns his own Productions Company, PR PRODUCTION Co. LTD. He is also a Technical Advisor for the JAF (Japan Aerobic Federation) and Vice President of JDA (Japan Dance Association). 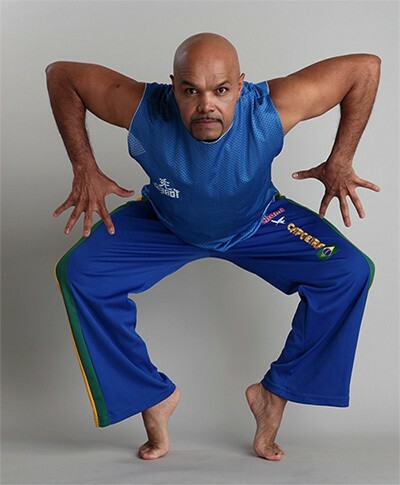 Paulo has worked with hundreds of athletes in Aerobic Gymnastics with results of over 90 National and International World Titles. Paulo’s love for dance and movement and the success of his programs inspired a vision of the World enjoying a life of love, happiness and success – which we all deserve, which is why he created the HAPPY DANCE POWER SYSTEM.